Trusted partner for manufacturing, designing and sourcing in China. Top and strong ability of manufacturing and researching in China. >Aluminum alloy, durable, wear-resistant, anti-corrosion, strong load-bearing, stable and safe. >Multi-steps wide anti-slip treads surface and padded handle grip for comfort and safety, can be folded when not in use; Bottom with non-slip feet protective pads ensures the stability and your safety, and also to help prevent damage to the floor. >High places can also be easily accessible, more affordable and convenient. >This lightweight aluminum step ladder is ideal for use around the home and garden for day to day tasks. It can be folded and stored away easily. It has been manufactured to the highest standard, conforming to GPSG & EN131 standards and is CE registered. >Whether it's reaching that high cabinet, changing a light bulb or washing the windows, our products make it easier to get any job done. 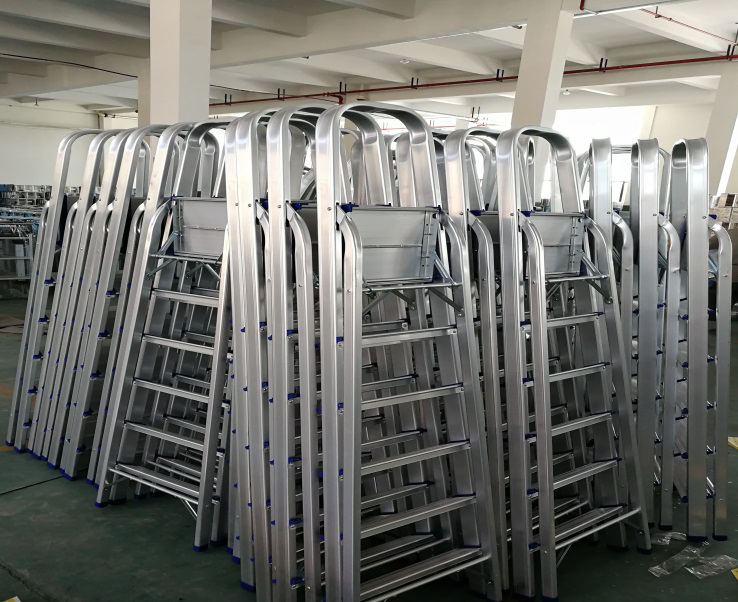 >With sturdy construction and durable aluminum alloy, this ladder is sturdy enough to withstand household tasks. >This ladder features slip-resistant steps for added safety and an extra-large top platform for long standing comfort. >In addition, the step ladder requires no assembly and is easy to open and close. >Most importantly, the slim profile and folding design allow easy movement and space-saving storage, which is suitable for domestic use.